Living in Kirkland, Arizona, and born in Gila Bend, Bill Owen is a painter in realist style of western genre, a subject and method near to his family because his father was a cowboy and his mother an artist. His painting skills have earned him membership and special recognition in western-art related organizations: the Cowboy Artists of America*, which he joined in 1973, and the National Academy of Western Artists* in 1991. 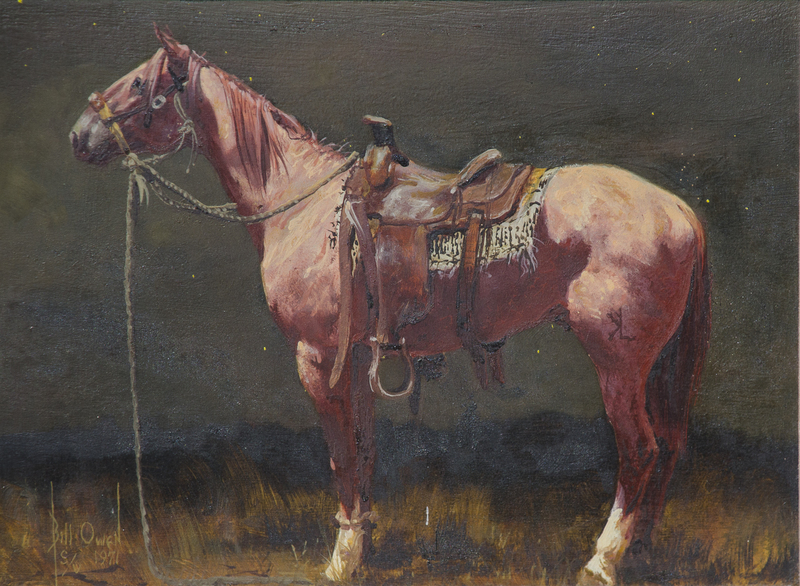 In 1993, he received the Frederic Remington Award* for Artistic Merit from the Cowboy Hall of Fame, and three years later, he was designated Rendezvous Artist by the Gilcrease Museum in Tulsa, Oklahoma. At the Prix de West* Invitational Exhibition and Sale in 2003, he was the first recipient of the Express Ranches Great American Cowboy Award*. As a member of the Cowboy Artists of America, he served as a three-time President, and four times received the CAA Award, which is determined by membership vote for the best overall exhibition entries. Owen’s painting achievements are earned in spite of a 1989 rodeo-related accident, which caused him to lose sight in his right eye. Before that time he had also been a sculptor, but the eyesight loss affected his depth perception, so he quit working in three-dimensional mediums. In 1995, Bill Owen established The Arizona Cowpuncher’s Scholarship Organization to pay for higher education for young people from ranching families in Arizona. Cowboy Artists of America 44th Annual Exhibition Catalogue, 2009, Published by the Cowboy Artists of America for their annual exhibition at the Phoenix Art Museum.